← Policing Wall Street: Is Maxine Waters Up to the Task? 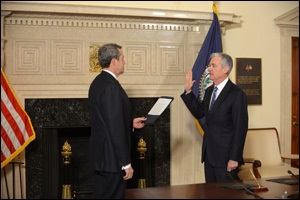 Jerome Powell Is Sworn In As Federal Reserve Chairman on February 5, 2018 by Fed Vice Chairman Randal Quarles. Remember that late 1930s play, “The Man Who Came to Dinner.” In the play (and later movie) the man slips on ice on the doorstep of his host, is injured, and never leaves. The question before the American people this week is if the Chairman of the Federal Reserve, Jerome (Jay) Powell, skidded on a slippery slope Monday evening when, on his 66th birthday, he chose to dine at the White House with the same President Donald Trump who has been bashing him for months in the press. Like the character in the play, will the Fed Chair now be thought of as the man confined to the House of Trump rather than as an independent central banker. The time line for Powell’s birthday dinner has the same rancid aroma of Trump’s favored weapon to try to bring people around to his way of thinking: berate them in the press or on Twitter, hint they’re going to be fired, get them to do his bidding, then invite them for dinner and extract, or at least infer, that he expects a loyalty pledge. On December 11, 2018 Trump again warned the Fed against raising interest rates in an interview with Reuters, stating that it “would be foolish” and “You have to understand, we’re fighting some trade battles and we’re winning. But I need accommodation too,” he said. Accommodating the President’s agenda is decidedly not the mandate of the Federal Reserve. In fact, it seriously undermines investor confidence for the Fed to be seen as a politically captured tool of the White House. That’s why other Presidents have steered clear of overtly interfering with the Federal Reserve’s decisions. Wednesday, January 30, 2019, Jerome Powell holds a press conference following a meeting of the Federal Open Market Committee, where it decided not to raise interest rates, giving Trump just what he wanted. In addition, the Fed delivered another major gift to Trump by doing a big flip-flop on its position of continuing to shrink its balance sheet. Powell stunned markets on Wednesday by saying “the normalization of the size of the portfolio will be completed sooner, and with a larger balance sheet, than in previous estimates.” The normalization of the balance sheet is a form of tightening of interest rates, since the Fed is allowing approximately $50 billion of its bonds to mature each month without rolling over the proceeds into new bonds. The Fed’s balance sheet had swollen from $914.8 billion at the end of 2007 to $4.5 trillion in 2014 as a result of its Quantitative Easing programs. That’s a fancy word for Wall Street having produced a mountain of unwanted debt securities with the Fed forced to become the buyer of last resort to keep bond interest rates from skyrocketing to a level that would elicit market demand. The Fed’s unwinding of its bond-buying program, which began in October 2017, has yet to make much of a dent in reducing its balance sheet, which stood at $4.039 trillion as of January 30, 2019. The Fed’s Trump-favored actions came on Wednesday, January 30. Just five days later, the Fed Chairman is being wined and dined on his birthday by Donald Trump at the White House. With each passing day, Trump is defining deviancy down and flinging open new doors for corrupt, crony capitalism to expand exponentially in Washington.